Agriculture is both a source and sink for greenhouse gases (GHG). A source is a net contribution to the atmosphere, while a sink is a net withdrawal of greenhouse gases. In the United States, agriculture is a relatively small contributor, with approximately 8% of the total greenhouse gas emissions, as seen below. 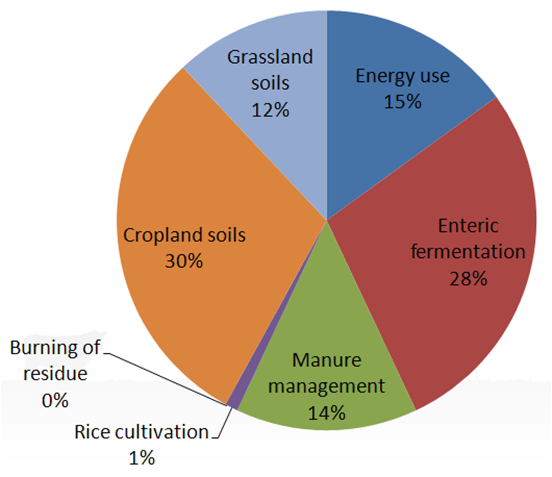 Most agricultural emissions originate from soil management, enteric fermentation (the ruminant digestion process that produces methane), energy use, and manure management. The primary greenhouse gases related to agriculture are carbon dioxide, methane, and nitrous oxide. 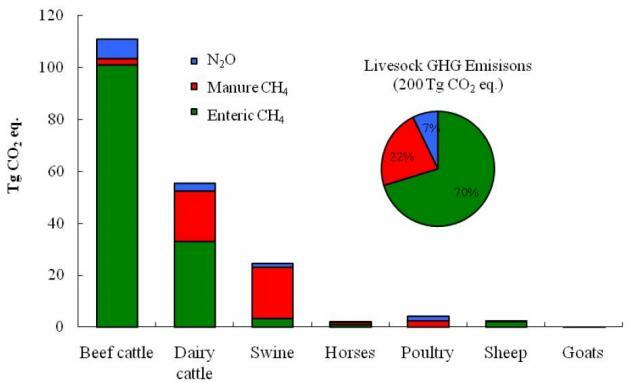 Within animal production, the largest emissions are from beef followed by dairy, and largely dominated by the methane produced in during cattle digestion. Excess nitrogen in agriculture systems can be converted to nitrous oxide through the nitrification-denitrification process. Nitrous oxide is a very potent greenhouse gas, with 310 times greater global warming potential than carbon dioxide. Nitrous oxide can be produced in soils following fertilizer application (both synthetic and organic). Some carbon dioxide is stored in soils for long periods of time. The processes that result in carbon accumulation are called carbon sinks or carbon sequestration. Crop production and grazing management practices influence the soil’s ability to be a net source or sink for greenhouse gases. Managing soils in ways that increase organic matter levels can increase the accumulation (sink) of soil carbon for many years. The next largest portion of livestock greenhouse gas emissions is from methane produced during enteric fermentation in ruminants – a natural part of ruminant digestion where microbes in the first of four stomachs, the rumen, break down feed and produce methane as a by-product. The methane is released primarily through belching. As with plants, animals respire carbon dioxide, but also store some in their bodies, so they too are considered a neutral source of atmospheric carbon dioxide. A similar microbial process to enteric fermentation leads to methane production from stored manure. Anytime the manure sits for more than a couple days in an anaerobic (without oxygen) environment, methane will likely be produced. Methane can be generated in the animal housing, manure storage, and during manure application. Additionally, small amounts of methane is produced from manure deposited on grazing lands. Nitrous oxide is also produced from manure storage surfaces, during land application, and from manure in bedded packs & lots. There are many smaller sources of greenhouse gases on farms. Combustion engines exaust carbon dioxide from fossil fuel (previously stored carbon) powered vehicles and equipment. Manufacturing of farm inputs, including fuel, electricity, machinery, fertilizer, pesticides, seeds, plastics, and building materials, also results in emissions. To learn more about how farm emissions are determined and see species specific examples, see the Carbon Footprint resources. To learn about how to reduce on-farm emissions through mitigation technology and management options, see the Reducing Emissions resources.